One of the things I was most excited to grab at ECCC this year was a physical copy of Rebel, a prequel fan comic about the heroine of Rogue One, Jyn Erso. She’s a unique character in the mythos of Star Wars in that she’s unconnected to the rest of the films series’ main characters, but positioned such that, without her, the events of those films would not unfold the way they do (or even at all). She’s a lynchpin of sorts, and she gets to be something that women don’t get to be on screen often enough: angry. Flawed. Impulsive. After reading the comic, I really wanted to speak with the creative team about it, and what it meant to be making a book like this purely out of love. What made you want to tell a story about Jyn Erso, and more specifically, what made you want to tell this story? Rogue One is my favorite Star Wars movie of the modern era. It’s a tough and costly story, but it shines a light on the heroism of people who aren’t acting out a part written for them by destiny. They’re doing what needs to be done simply because it needs to be done, and damn the personal cost. That kind of story is tailor-made to appeal to me, and I find it exceptionally powerful that for one thin moment, the entire fate of the Rebel Alliance and everything that follows rests in the hands of one beleaguered and misunderstood woman who just can’t give up. Gavin Guidry: I LOVED Rogue One, personally. I was still working a few days a week at a movie theater at the time of its release and saw it 3 times inside of the first week. I came to the project after the script was already completed, but it was a great chance to work on something featuring a character I really enjoyed from the movie, as well as the chance to work on a script with more action than I’d previously had the chance to. What’s not to love? Addison Duke: To me Rogue One is the most solidly grounded films in the Star Wars Universe. It has so much that is often grazed over by the more mythical Skywalker Legacy films. I think what makes Star Wars so intriguing is that feeling of a lived-in galaxy. Rogue One really played in that space so well, reminding us how Galactic Civil war affected everyone in the galaxy. 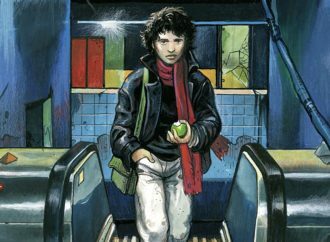 So, when it came to Rebel it was such a great opportunity to tell more of those street level (literally) stories. Once you had the idea for the comic, what was the process like? How did everyone get involved? Lowery: This was, as they say, a long strange trip. I first wrote the script in late 2017 (along with a few other scripts) as a challenge to myself to write big, broad, PG-13 action. I actually had another artist tapped to start – someone who essentially cold-called me asking if I had any sci-fi work I wanted done. He ghosted on me, and I got to talking with Gavin (with whom I’d already done The Night Driver, along with Micah) and went from there. Guidry: Yeah, I’d known for a little while that Ken was planning on having Rebel made with this other artist, and eventually, it’d just been so long since he’d heard anything in return, that we started talking about it being the next thing we’d do together. We were actually talking about it during our post-breakfast walk back to our hotel, in downtown Austin, during Staple! a couple of years ago. He got around to describing the chase scene and I was sold. Duke: I first found out about Rebel when I met Gavin at C2E2 2018. He had brought a few pages of it with him and was working on it at his table during the show. I kept stopping by and hanging out in between wandering around the rest of the show. The more art I saw the more I knew I wanted to be a part of the project and let Gavin know should it come to the point where they needed colors that I was all in. I was super excited when a few months later I got a message from Gavin that he had completed all the line work and with a script in hand then the real fun began! Micah Myers: I got invited to work on the book when Gavin and Ken asked to letter it. I was excited to work with them again after the fun I had on Night Driver. Plus, a chance to make something in the Star Wars universe even if it isn’t official. 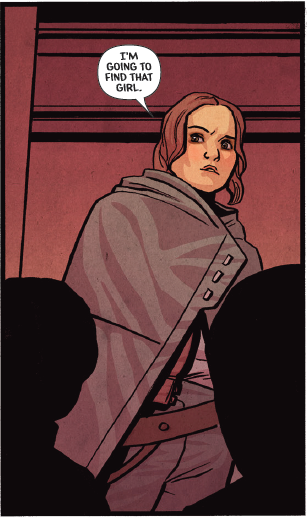 It is still cool to have a Star Wars comic on my resume. My personal take on Rogue One was that I liked it, but I felt like Jyn needed something. Some kind of win. It’s a long story where a lot of ugly things happen to her, and then there’s that ending. I really appreciated that this story gave that to her, gave her a motivation that wasn’t rooted in anger and pain, necessarily. Was that an intentional goal for you? Lowery: The market ambush in Jedha City was key to unlocking Jyn Erso for me. Cassian wants to get Jyn out of there as soon as the Partisans and Imperials start going at it, but the very second she sees a little girl crying and afraid she rushes headlong into suicidal danger to save her. I felt a jolt in the theater watching that scene, and eventually that sequence suggested the emotional and moral core of Rebel (which you will note is also about Jyn making a snap decision to rescue a girl at great personal cost). I like to think that while Jyn wants to keep her head down and be left alone, she will still put it all on the line because she believes in the worth and dignity of everyday people. Obviously you have strong visual cues to adhere to, given the universe this story takes place in, but there’s still a very considered feel to the look that’s present here–the palette used for the book is gorgeous. Gavin and Addison, can you go into what designing your version of Nar Shaddaa was like, and the things you wanted to convey, both in the linework and the coloring? 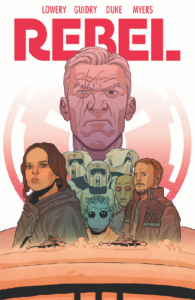 Guidry: To my knowledge, at the time of us making the book, Nar Shaddaa had only really been shown scantly in some games and in a few issues of Immonen’s run of Star Wars with Jason Aaron, so there wasn’t a whole lot of visual reference to go off of. I think we leaned into the more run-down nature of the planet a little more, so it was a lot of trying to stay away from the more high-tech building shapes, while still remaining as faithful to the “Star Wars” aesthetic. I think the backgrounds themselves were the hardest/most rewarding aspect of that visual language. Duke: We never really got to see anything that came close to Nar Shaddaa’s aesthetic until Corellia in Solo (which I loved). They are both these polluted industrial planets, but while Corellia is a purely industrial pollution with a strong imperial presence (so lots of cool greys and blues), Nar Shaddaa has a moral pollution, a corruption, the planet that produced the Hutts. So, when thinking about colors I immediately started leaning towards greens, browns, yellows, and reds, pulling colors from Jabba’s palace in ROTJ. I tried to expand that palette to an entire city and built off what Gavin already established in his linework. Once again it came back to that street level aesthetic to me. This would be such an oppressive place to live. What little money you made at your industrial job would be funneled right back into the bight neon lit cantinas and gambling halls of the Hutts. Beacons of false hope in these dingy polluted streets. The only other time we see these bright beacons of hope are in the sign of the spaceport and the glow of the ships engines that might take you away from this wretched place. 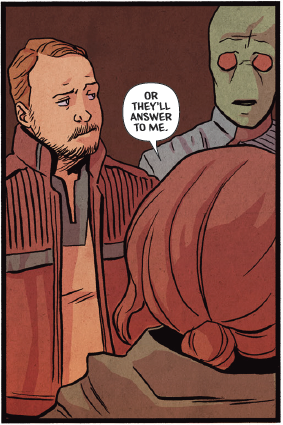 Gavin, Ken has outed you as the reason there is a Star Wars version of him in the comic. Does that make Kyn your OC? Is it a joint ownership? Will we be seeing a Kyn spin-off? Guidry: Haha. 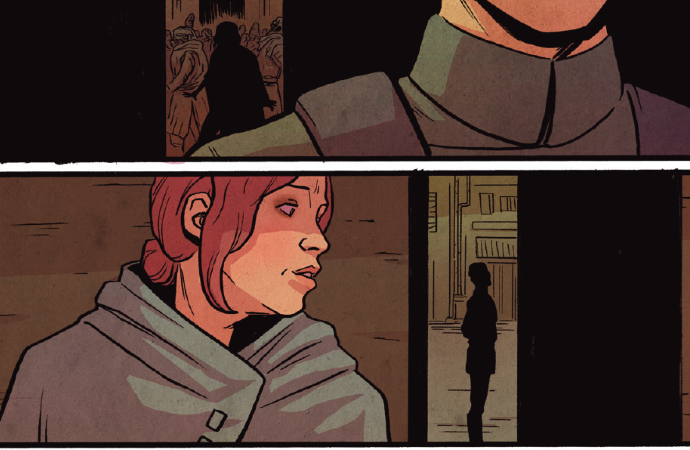 Well, it’s my special brand of nerd narcissism to sneak myself and my friends into the comics I make. Space Kyn™ was a no-brainer for me, and I thought it would be a fun thing for him. If I remember correctly it was more of a telling and not asking thing. I think I had him penciled and just sent a shot to Ken like “by the way, you’re in this, if you’re cool with it.” He’s definitely one of my favorite aspects of the book. Any time Ken wants to relive his glories in a galaxy far, far away, I’m there for it. Lowery: If someone would like to fund the story of Space Kyn and Space Gavin (I’ve just decided that’s who the Duros is) fleeing Imperials with a Force-wielding orphan in tow, please reach out. Micah, can you go into your lettering process here? There’s a chunkiness to the typeface, it’s heavier than some lettering I’ve seen, and the pronounced slant on it gives it a kind of energy that really helps the momentum of the comic. Is this a regular typeface you use, or did you select it specifically for this kind of story? Myers: I pick fonts based on the art and the feel of the story. The font I used on this is the same font I used on Night Driver which obviously has the same artist. The font is called “Tough As Nails” not that the name had anything to do with the choice, but it does fit in with Jyn Erso. I also was excited that I got to letter the one character in the bazaar with Aurebesh, the Star Wars written language. How did you make the decision to donate the book’s proceeds? How and why did you land on your choice of charities? Lowery: Right off the bat I knew we couldn’t keep any money this comic made from digital sales, so I hit on the idea of donating the contributions. I decided to stick to a regional charity because I thought they would feel the impact more than a national one, and picking a charity focused on helping homeless youth just felt thematically right. There were a few good local candidates, but this story put Promise House over the top. Homeless rates among LGBT youth are epidemic, and if our humble fan comic could help, we just about had to. You can find a digital copy of Rebel on Gumroad for whatever you’d like to pay; all proceeds are going directly to Promise House.